How have you been? I hope all is well. It's been a pretty busy year for me, and I havent been getting as much time in the water as i'd like, but made it out yesterday to PV for a beautiful morning. I saw a big seabass about a month ago, but couldn't get close enough for a shot. Yesterday we didn't see any bait, barracuda or seabass, but there were plenty of reef fish. My buddy and I took my younger brother for his first spearing adventure, and I think he is hooked. I took a decent sized calico on the way back in. Definitely the largest I have ever taken. 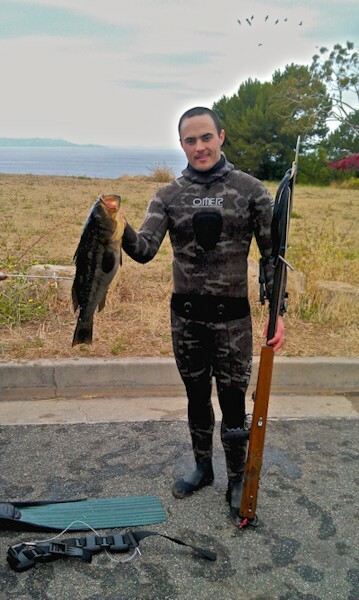 I attached a pic for you, as I don't think I have sent you any fish pics with your gun. The gun is still performing beautifully, and I couldn't be happier with it. How has your fishing been this year?